Epic historical drama directed by Ridley Scott. Set in Roman times, the story follows Maximus (Russell Crowe), a powerful Roman general, loved by the people and the aging Emperor, Marcus Aurelius (Richard Harris). However, before his death, the Emperor chooses Maximus to be his heir over his own son, Commodus (Joaquin Phoenix), which causes a power struggle, leaving Maximus and his family condemned to death. After being unable to save his family, Maximum is sold into slavery to be trained as a gladiator. The only desire that fuels him now is the chance to rise to the top so that he will be able to look into the eyes of the man who will feel his revenge. Maximus: Lean and hungry. Still nothing? Maximus: How long has he been gone? Valerius: Will they fight sir? Maximus: We shall know soon enough. Maximus: At my signal, unleash hell. Maximus: Three weeks from now, I will be harvesting my crops. Imagine where you will be, and it will be so. Hold the line! Stay with me! If you find yourself alone, riding in the green fields with the sun on your face, do not be troubled. For you are in Elysium, and you’re already dead! Commodus: Do you think he’s really dying? Lucilla: He’s been dying for ten years. Commodus: He’s made his decision. He’s going to announce it. He will name me. The first thing I shall do, well, is honor him with games worthy of his majesty. Lucilla: For now, the first thing I shall do is have a hot bath. Marcus Aurelius: You have proved your valor, yet again Maximus. Let us hope for the last time. Maximus: There is no one left to fight, sire. Marcus Aurelius: There is always someone left to fight. How can I reward Rome’s greatest general? Maximus: Let me go home. Commodus: Have I missed it? Have I missed the battle? Marcus Aurelius: You have missed the war. Commodus: Father, congratulations. I shall sacrifice a hundred bulls to honor your triumph. Marcus Aurelius: Save the bulls. Honor Maximus. He won the battle. Quintus: Maximus the farmer. I still have difficulty imagining that. Maximus: You know dirt cleans off a lot easier than blood Quintus. Commodus: Well, no one has earned it more. Don’t get too comfortable, I may call on you before long. Marcus Aurelius: If only you had been born a man, what a Caesar you would have made. Marcus Aurelius: You would have been strong. I wonder, would you have been just? Lucilla: I would have been what you taught me to be. Marcus Aurelius: Enough of politics. Let us pretend that you are a loving daughter, and I am a good father. Lucilla: This is a pleasant fiction, isn’t it? Marcus Aurelius: Tell me again, Maximus, why are we here? Maximus: For the glory of the Empire, sire. Marcus Aurelius: Yet you have never been there. You have not seen what it has become. I am dying, Maximus. When a man sees his end, he wants to know there was some purpose to his life. How will the world speak my name in years to come? Will I be known as the philosopher? The warrior? The tyrant? Or will I be the emperor who gave Rome back her true self? There was once a dream that was Rome. You could only whisper it. Anything more than a whisper and it would vanish, it was so fragile. And I fear that it will not survive the winter. Maximus, let us whisper now, together you and I. You have a son? Marcus Aurelius: Tell me about your home. Marcus Aurelius: When was the last time you were home? Maximus: Two years, two hundred and sixty-four days and this morning. Marcus Aurelius: There is one more duty that I ask of you before you go home. Maximus: What would you have me do Caesar? Marcus Aurelius: I want you to become the protector of Rome after I die. I will empower you to one end alone, to give power back to the people of Rome and end the corruption that has crippled it. Marcus Aurelius: Do you accept this great honor that I have offered you? Maximus: With all my heart, no. Marcus Aurelius: Maximus, that is why it must be you. Marcus Aurelius: Commodus is not a moral man. You have known that since you were young. Commodus cannot rule. He must not rule. Marcus Aurelius: You’re the son that I should have had. Commodus will accept my decision. He knows that you command the loyalty of the army. Lucilla: My father favors you now. Lucilla: It was not always so. Lucilla: Many things, not everything. Lucilla: What did my father want with you? Maximus: To wish me well before I leave for home. Lucilla: You’re lying, I could always tell when you were lying because you were never any good at it. Maximus: I never acquired your comfort with it. Lucilla: True, but then you never had to, life is more simple for a soldier. Or do you think me heartless? Maximus: I think you have a talent for survival. Maximus: Ancestors, I ask you for your guidance. Blessed mother, come to me with the Gods’ desire for my future. Blessed father, watch over my wife and son with a ready sword. Whisper to them that I live only to hold them again. Ancestors, I honor you and will try to live with the dignity that you have taught me. Maximus: Do you find it hard to do your duty? Cicero: Sometimes I do what I want to do. The rest of the time, I do what I have to. Marcus Aurelius: Are you ready to do your duty for Rome? Marcus Aurelius: You will not be emperor. Commodus: Which wiser, older man is to take my place? Marcus Aurelius: My powers will pass to Maximus, to hold in trust until the Senate is ready to rule once more. Rome is to be a republic again. Marcus Aurelius: My decision disappoints you? Commodus: You wrote to me once, listing the four chief virtues: Wisdom, justice, fortitude and temperance. As I read the list, I knew I had none of them. But I have other virtues, father. Ambition. That can be a virtue when it drives us to excel. Resourcefulness, courage, perhaps not on the battlefield, but there are many forms of courage. Devotion, to my family, to you. But none of my virtues were on your list. Even then it was as if you didn’t want me for your son. Marcus Aurelius: Oh, Commodus. You go too far. Commodus: I search the faces of the gods for ways to please you, to make you proud. One kind word, one full hug, where you pressed me to your chest and held me tight. Would have been like the sun on my heart for a thousand years. What is it in me that you hate so much? Commodus: Father. I would have butchered the whole world, if you would only love me! Maximus: Quintus, look at me. Look at me! Promise me that you’ll look after my family. Quintus: Your family will meet you in the afterlife. Maximus: The frost, sometimes it makes the blade stick. Maximus: Blessed father, watch over my wife and son with a ready sword. Whisper to them that I live only to hold them again, for all else is dust and air. Juba: Don’t die. They’ll feed you to the lions. They are worth more than we are. Slave Trader: Not a chance. Slave Trader: I’ll do a special price for you! Proximo: Do any of them fight? I’ve got a match coming up. Slave Trader: Some are good for fighting, others for dying. You need both, I think. Proximo: …Gladiators, I salute you. Proximo: Some of you are thinking you won’t fight, some that you can’t. They all say that until they are out there. Listen. Proximo: Thrust this into another man’s flesh and they will applaud and love you for that. You may begin to love them for that. Proximo: Ultimately, we’re all dead men, sadly we cannot choose how, but we can decide how we meet that end in order that we are remembered as men. Gracchus: He enters Rome like a conquering hero. What has he conquered? Falco: Give him time. He’s young. I think he could do very well. Gracchus: For Rome or for you? Gracchus: But the Senate is the people, Sire, chosen from among the people, to speak for the people. Commodus: I doubt if many of the people eat so well as you do, Gracchus, or have such splendid mistresses Gaius. I think I understand my own people. Gracchus: Then perhaps Caesar would be so good as to teach us, out of his own extensive experience. Gracchus: Have you ever embraced someone dying of plague, Sire? Commodus: No. But if you interrupt me again, I assure you that you shall. 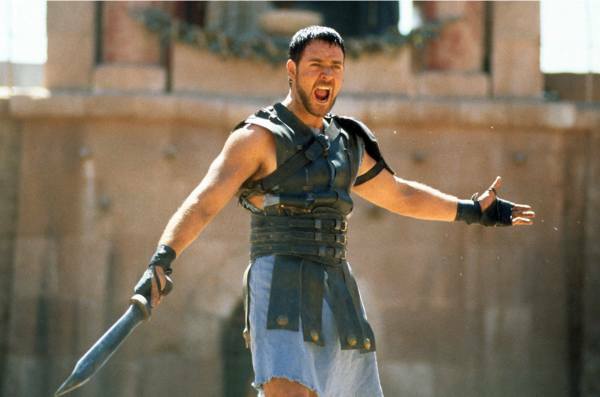 Maximus: Are you not entertained?! Are you not entertained?! Is this not why you are here? Proximo: What do you want? Hmm? Girl? Boy? Maximus: You sent for me? Proximo: Yes I did. You are good, Spaniard, but you’re not that good. You could be magnificent. Maximus: I am required to kill so I kill. That is enough. Proximo: That’s enough for the provinces, but not for Rome.